We’ve reached that magical point in the summer where the tomatoes are starting to ripen. For a couple days we brought in only a handful of sweet cherry, grape, sun gold, or yellow pear tomatoes, but in the last few days we’ve brought in almost nine pounds of tomatoes and have more on the way. As long as something devastating doesn’t happen (knock on wood) we’re set to have a good crop of tomatoes. Right now we are harvesting Early Girl, Brandywine, Mr. Stripey, Cherokee Purple, and Roma, and we have some other varieties that aren’t ready yet but should be soon. On the other hand, the zucchini is not doing so well. We had a cold wet spring that went all the way through the end of May and slowed plant growth, plus the plants can’t seem get on a coordinated flowering schedule. Zucchini needs both male and female flowers open at the same time in the morning for pollination, and we’ve only had one flower open at a time. So we are stuck buying zucchini for now but still hopeful that we’ll get at least a few zucchini from the garden this summer. 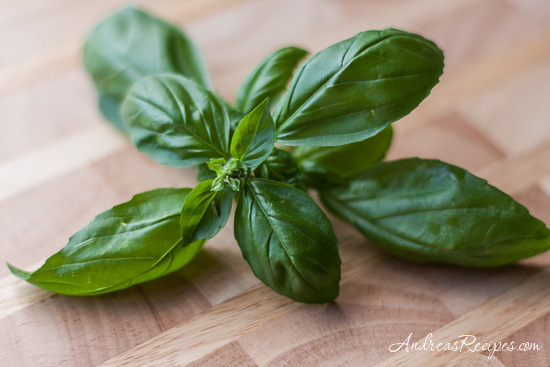 The basil is starting to perk up after toughing out the really wet spring. The plants looked like they wouldn’t thrive but have finally taken off. One of the parsley plants was lost to the overwhelming rains but the other seems to have survived and is slowly coming around. This dish is my take on a classic that is easy to prepare and full of some of our favorite flavors. 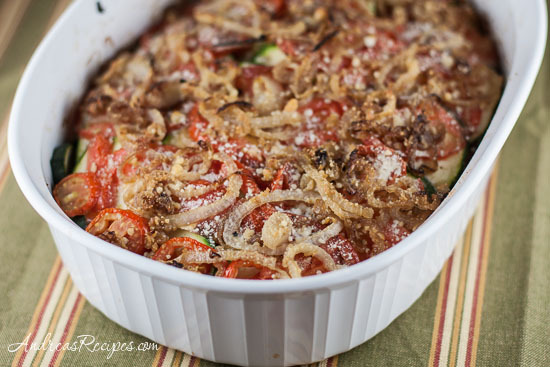 We layer the tomatoes and zucchini and tuck basil chiffonade and chopped parsley in between the layers, then top it off a drizzle of olive oil, sautéed onions and garlic, and a sprinkle of grated Parmesan. It’s simple, healthy fare that works as a side dish or a light main course. This is my contribution to Grow Your Own, the blogging event that celebrates the dishes we create from foods we’ve grown, raised, foraged, or hunted ourselves. MomGateway is our host for this round, so be sure to visit the blog for more information about submitting your post. Posts are due on August 15. If you are new to the event, you can read more about the rules for participating at the Grow Your Own page. We hope you will join us! 2. Warm the skillet over medium heat and add 2 tablespoons of the olive oil. Sauté the onions until translucent, about 5 minutes. Add the garlic and sauté for another 2 minutes. Remove from heat. 3. Lightly brush the bottom of the baking dish with olive oil. 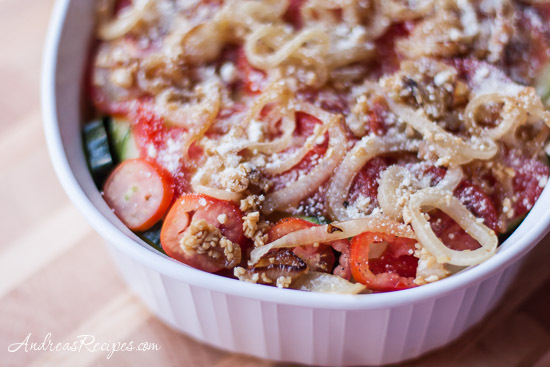 Arrange zucchini slices around the bottom of the pan, then add a layer of tomatoes. Sprinkle on the chopped parsley. Repeat with another layer of zucchini and another layer of tomatoes, then sprinkle on the basil chiffonade. Add the final layer of zucchini, then the tomatoes. 4. Arrange the onions and garlic around the top of the casserole. Sprinkle on a pinch or two of sea salt and a few grinds of black pepper. Drizzle the remaining olive oil around the top and sprinkle on the Parmesan cheese. 5. Bake in the preheated oven for 45 to 60 minutes. At the 45 minute mark the zucchini will be tender but not soft, so bake longer if you want it very tender. Remove from the oven and allow to rest about 5 minutes before serving. There will be plenty of juice in the bottom of the pan, and you can drizzle it over the top for more flavor. That gratin looks so delectable! A wonderful dish! oh yes this is the perfect summer dish! 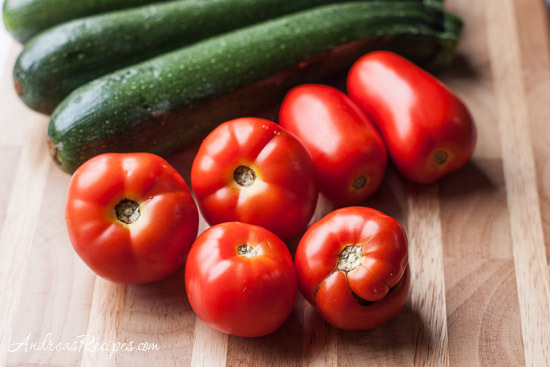 love both tomatoes and zucchini! I just printed a recipe out to make something very similar to this today! Sounds delicious. Here the zucchini are great, but in the renovations my sprinkling system got re-designed and the station where the tomatoes are was turned off for weeks before I noticed. So my tomatoes are not feeling particularly happy! I’m getting a few finally, but not many. Is it bad that I’m a bit jealous that your zucchini plants are producing? I’m drowning in them! And I’m also bringing in pounds of tomatoes every day. Thanks so much for this timely and fresh recipe! I have way more zucchini than I know what to do with…this recipe just might be next! Looks delicious! Our tomatoes yielded very little this year while last year, we had plenty. Love the gratin, what a great dish! So Pretty! Everyone has their own version it seems, yours is close to mine, but I have no ripe tomatoes yet! My basil has finally taken hold too, after a brutally wet summer. Now I have something to trade with friends who are experiencing a tomato and zucchini glut. And I’m bookmarking this recipe to make when those zucchini start appearing on my doorstep. What gorgeous summer produce! And a great healthy idea to us them up. Looks delicious, I can almost smell it. Yum, a perfect way to showcase your garden bounty! The recipe allows the flavors of each vegetable to come through! I cooked it for a full hour. Thank you! Gorgeous! This is the perfect summer dish! Just found your blog and made this tonight. I loved it! Esp. the onions, which I wish I had added more of. Next time I will make it in one layer because the bottom zucchini were overcooked (in my opinion) while the top were more al dente, which is how I prefer. I baked it for 35 mins but next time with one layer will maybe do less. But I loved all the flavors together and plan to make it again. Thanks!